This past Saturday, 20th of October, we had our monthly solar cooking class to which we had about 13 attendees and lots of food to sample. We cooked up breakfast sausages on the Solar Burner along with hot cocoa and cider to take away the slight morning chill that was evident for the first time in a while at one of our solar cooking classes. 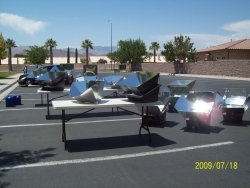 Joyce, my assistant used her Solar Burner Parabolic to fry up some pumpkin scones for the class participants and we also popped popcorn, "hard baked" eggs in the Hot Pot, Saute'd , or baked, sliced onions with seasonings and did our popular solar baked cinnamon apples in the Sport Oven and the Tulsi Oven. We baked sweet rolls in the Sun Oven and Joyce started her dinner of chicken curry that would be finished later on in the day. We also did a dehydrated soup mix and a military (MRE) macaroni and cheese tray that all of the former vets were anxious to try, just to see if it had improved over the years...in this case,it had not. The participants came from as far away as Las Vegas, and all enjoyed the class, the food and the information.